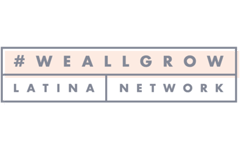 Disclosure: This post was created as a collaboration with Latina Bloggers Connect and Kikkoman Soy Sauce. However, all views and recipes are my own. 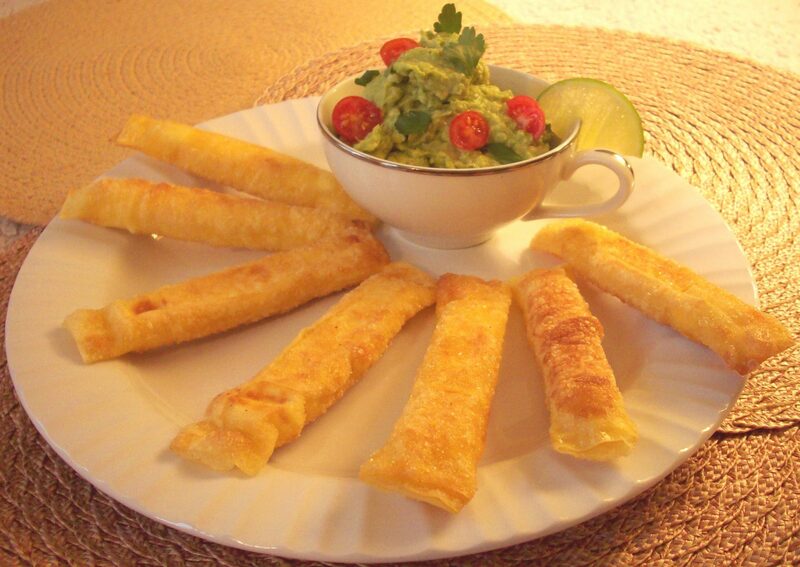 Tequeños are one of Peru´s favorite adopted finger foods. 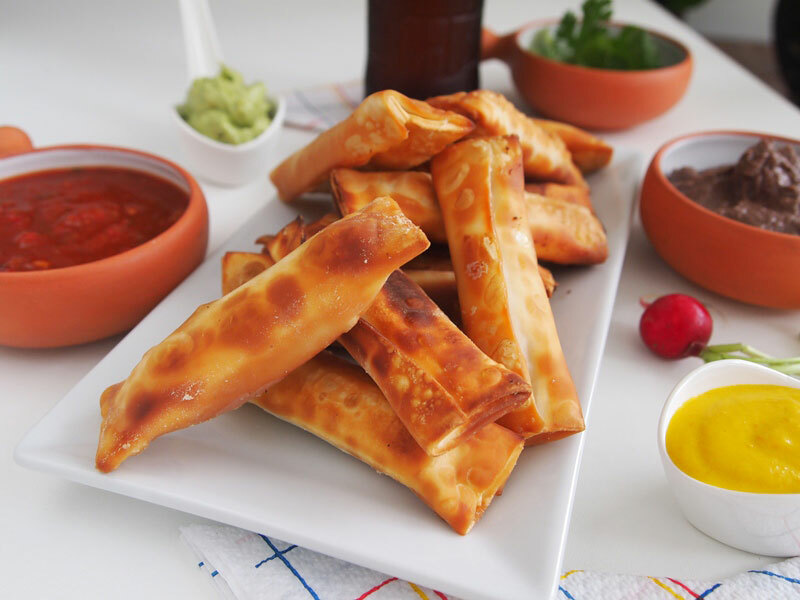 The classic one, filled with cheese and served with avocado sauce, was for many years the only version made here, but lately I have tried many exciting variations, as cooks are now much more open to trying new flavors and reinventing their dishes. 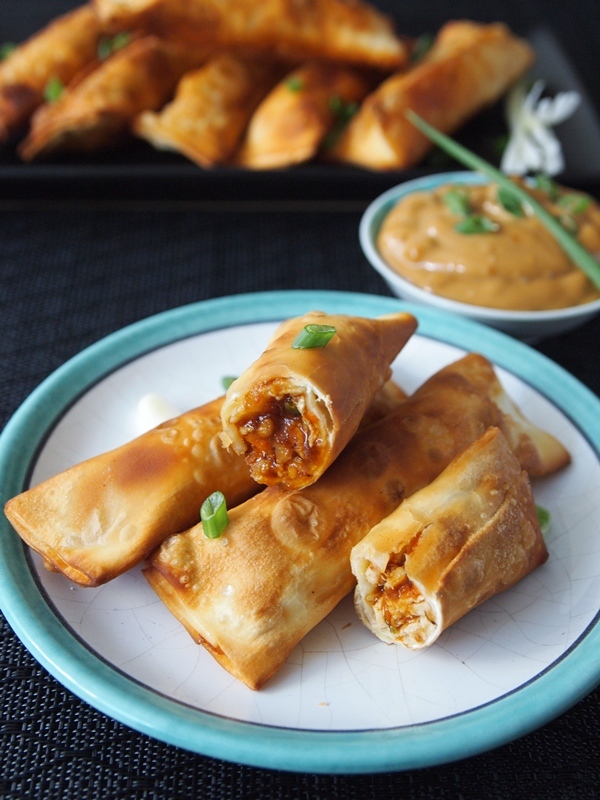 The tequeños I’ve made today are filled with chicken, and served with a creamy sauce made with mayonnaise, Kikkoman soy sauce, ginger and garlic. This sauce can be made in advance and kept in the fridge, but take it out and bring it to room temperature before serving. Do not heat this sauce. For the filling, I used finely chopped chicken loins -feel free to use ground chicken or turkey-, seasoned with garlic and ginger. Then I stir fried it in a little oil until the chicken was cooked, seasoned it with Kikkoman soy sauce, salt and pepper, and let it cool to room temperature. You can also prepare the filling in advance. 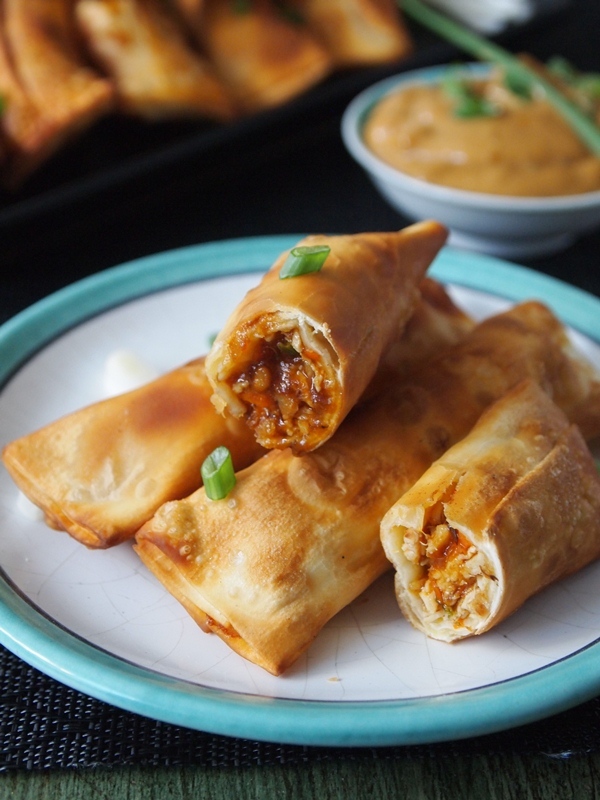 Tequeños must be filled and fried before serving, so it´s a good idea to have both the sauce and the filling ready. This saves you time in the kitchen and you can relax, have a glass of wine, and have fun with your family and friends. Combine the chicken, garlic, ginger, and scallions in a bowl. Heat the tablespoon oil in a skillet over medium heat. Sauté the chicken until cooked, and add the carrot, salt, pepper, and Kikkoman soy sauce. Turn off the heat and reserve. When the chicken is at room temperature, make the tequeños: Put one teaspoon filling in one of the edges of each wonton dough sheet. Wet your fingertip with a little water and moist the edges of the wonton dough. Roll like a jelly roll, beginning with the side of the filling. Press the two sides to seal and make as many tequeños as possible. Heat the vegetable oil in a saucepan and fry the tequeños until golden brown, (about two minutes per side). Drain on paper towels and serve immediately. Heat the oil in a skillet, fry the garlic, ginger and scallion until fragrante. Turn off the heat and cool. 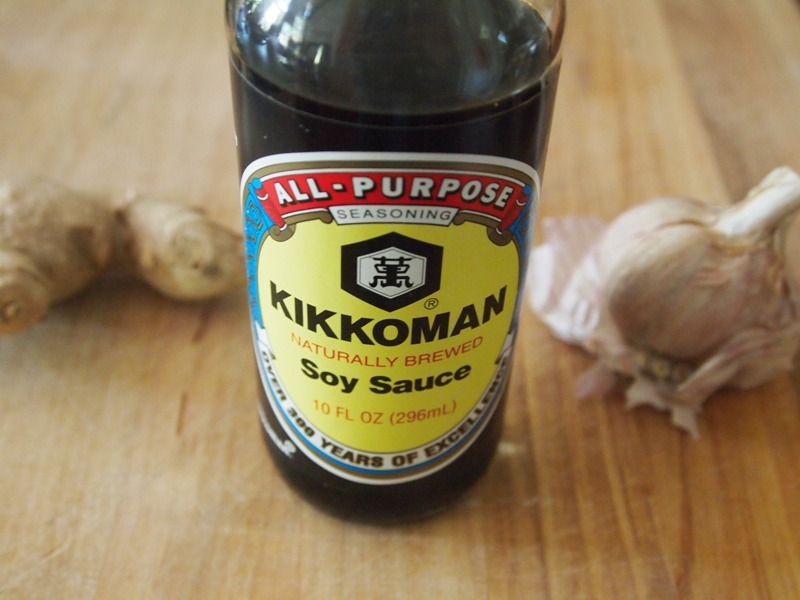 Combine with the mayonnaise, Kikkoman soy sauce, sesame oil, and stir. Put the sauce in a dish next to the tequeños, and sprinkle with scallion greens. These look and sound incredible! I love the flavor combination of chicken, ginger, soy, and garlic—yum!